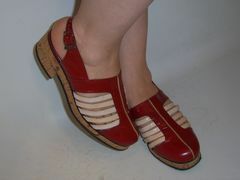 Here you can see the photos of my custom shoes designed and made by my Dad Lermont back in the 1970's. I never wore shoes bought from a store until we moved to the United States from Armenia. My Dad designed and made all our shoes-for me, for my two brothers, for my Mom, and for himself. All my friends were jealous of me because my shoes always stood out and looked much nicer than theirs. It is amazing how good these shoes still look after all these years! I can credit that to my Dad's high quality work. This is a clear proof of my Dad's excellent skills and talents. I'm so proud of my Dad Lermont. After we moved to the United States he stopped designing and making custom shoes because he got into the shoe repair business. He worked in that specific field since the mid-1970's. You can ask other shoe repair men, if they've ever designed or made shoes by themselves. If they are honest, most of them (if not all of them) will tell you "No." When it comes to shoe repair, my Dad Lermont is unique because of his skills and ability to make custom shoes. He is capable of fixing particularly difficult shoe problems that other shoe repair men would either turn down or make worse. Don't take my word for it. Just read a few of his customers' testimonies on the Home Page. You might think that I'm saying all this because Lermont is my Dad. Maybe I like to brag about him a little. But his customers saw it for themselves. If you needed a shoe repair expert and you lived in the Los Angeles area, you may have visited my Dad's shoe repair shop at 4121 Pennsylvania Avenue, Suite J, La Crescenta, CA 91214. The cross street is Montrose Avenue. It is right off of Freeway 210. His shoe repair shop was convenient to visit if you lived in the Foothill Boulevard area, in Tujunga, La Crescenta, La Canada Flintridge, Pasadena, Verdugo Hills or Glendale. Some of his customers drove all the way from Hollywood, West Los Angeles and Beverly Hills. You can check Google Maps where Lermont's Shoe Service used to be located. 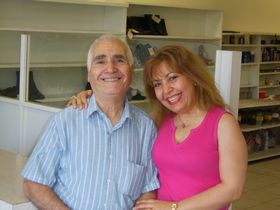 The majority of his customers agreed with me that Lermont was #1 shoe repair expert in the Los Angeles area. I wore all three pairs of these custom shoes very often while in Armenia. My husband Patrick and I took these photos to put them on this website. As you can see they still are in excellent shape after all these years. Kids Dress Shoes that my Dad made for him when he was 3 years old. 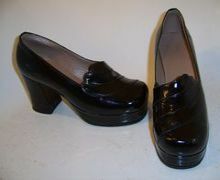 Those on the right are cork sole shoes that were in high demand back in the 1970s. I used to wear them almost daily. 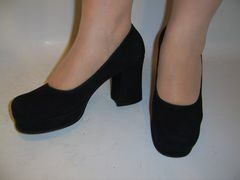 Designing and making shoes like these require a lot of talent, imagination, skills and a lot of work. I've seen how my Dad designed and made these shoes. 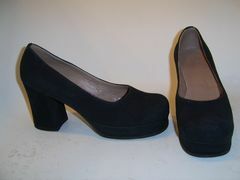 The following pair of shoes are womens suede shoes that my Dad Lermont made for me back in the 1970's. I still wear them. However, after more than 40 years in business, my Dad has recently closed his Shoe Repair Shop and gone into retirement.